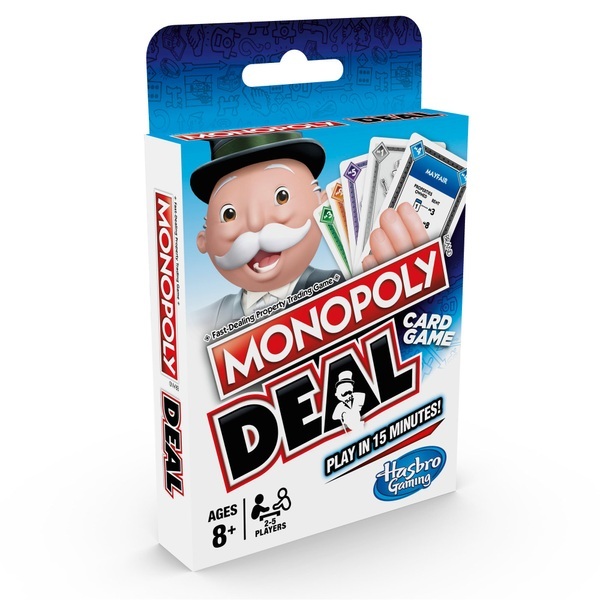 The Monopoly Brand Deal Card Game is all the fun of the Monopoly game in a quick-playing card game. With 110 cards including Property Cards, Rent Cards, House and Hotel Cards, and Wild Property Cards. Action Cards let players do things such as charge rent and make tricky deals. House and Hotel Cards raise rent values. Wild Property Cards help players build Property sets. And, players pay their debts with Money Cards. Be the first player to collect 3 complete Property Card sets in different colours to win. This card game is a great way to play the Fast-Dealing Property Trading Game on the go and in as little as 15 minutes!